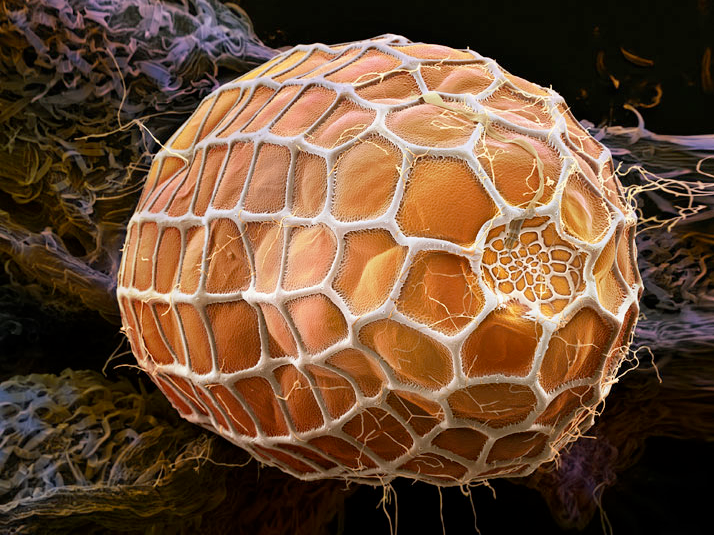 I just stumbled on an amazing series of images from the National Geographic website. 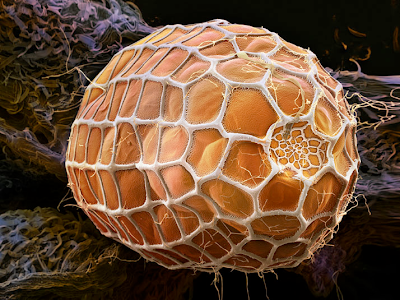 They are photos of butterfly eggs made with a scanning electron microscope. The resulting photographs by Martin Oeggerli are otherworldly and beautiful. Meet at Van Cortland Nature Center. The history of birding and Van Cortlandt Park are inseparable. Influential birders such as Roger Tory Peterson and Allan D. Cruickshank got their starts on Van Cortlandt’s ecologically diverse grounds. These walks celebrate the tradition set forth by these great ornithologists. Participants will look for various species of migrants and discuss a wide range of avian topics. Birding and biking, a natural combination! Join us in an eco-friendly excursion. Meet at Grand Army Plaza Arch at Prospect Park followed by a 13 mile ride to Jamaica Bay Wildlife Refuge where we will dismount and explore the trails in search of migratory shore birds and water fowl. Group can return by subway or bike. Limited to 15. Bring lunch, water and binoculars. 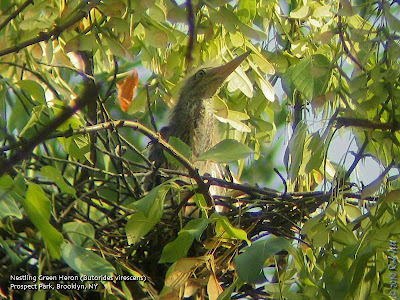 Bring your own binoculars, as we search for the birds of Van Cortlandt Park. Frogs! Turtles! And Snakes! Oh My! Greetings. This is the New York Rare Bird Alert for Friday, August 27th 2010 at 11:45pm. The highlights of today's tape are AMERICAN WHITE PELICAN, AMERICAN AVOCET, WHIMBREL, HUDSONIAN GODWIT, MARBLED GODWIT, BAIRD'S SANDPIPER, BUFF-BREASTED SANDPIPER, GLAUCOUS GULL, GRASSHOPPER SPARROW, LINCOLN'S SPARROW and BLUE GROSBEAK. The previously reported AMERICAN WHITE PELICAN was still present Thursday at the East Pond at Jamaica Bay where high water levels last week apparently hindered shorebirding efforts. The AMERICAN AVOCET also lingered through the week up to today at Oceanside Marine Nature Study Area at the western border along Biddle Creek. Single WHIMBRELS were reported at Napeague Bay on Sunday and at West End Jones Beach on Wednesday. Birders had a gorgeous godwit day last Sunday at Cupsogue County Park where 10 MARBLED GODWITS and 12 HUDSONIAN GODWITS were encountered. Another MARBLED GODWIT was reported last Sunday from Mecox Bay among 15 species of shorebirds including 29 WHITE-RUMPED SANDPIPERS, 5 STILT SANDPIPERS, a WESTERN SANDPIPER and 2 BLACK TERNS. A BAIRD'S SANDPIPER was found at the cricket field at Floyd Bennett Field on Thursday along with about 100 Semipalmated Plovers. Last Saturday a BUFF-BREASTED SANDPIPER was found in the swale area in front of the bathhouse at parking field 2 West End Jones Beach among over 200 assorted shorebirds. A GLAUCOUS GULL was still present through Wednesday at the ferry slip at Orient Point. A GRASSHOPPER SPARROW and a LINCOLN'S SPARROW were found Thursday at the Great Hill area of Central Park. The LINCOLN'S SPARROW was still there on Friday. A BLUE GROSBEAK was seen Thursday at the Vale of Cashmere area at Prospect Park where 13 species of warblers were found in the park highlighted by a LOUISIANA WATERTHRUSH. Migrating warbler numbers and species increased last week with 12 to 18 species of warblers reported today by several parties at Central Park highlighted by TENNESSEE WARBLER, BLACKBURNIAN WARBLER and WILSON'S WARBLER. Yesterday 12 species of warblers were counted at Central Park featuring a WORM-EATING WARBLER. Another WORM-EATING WARBLER was seen with another 12 species of warbler at Prospect Park along with a YELLOW-BELLIED FLYCATCHER on Tuesday with 12 species of warbler reported last Saturday at Prospect Park. Other Central Park arrivals on Thursday were RED-BREASTED NUTHATCH, BLUE-GRAY GNATCATCHER, BLACK-BILLED CUCKOO and YELLOW-BILLED CUCKOO. Other interesting sightings last week were 2 COMMON MOORHENS at the East Pond at Jamaica Bay on Thursday, 160 to 170 BLACK TERNS at Napeague Bay last Saturday, 44 "Western" WILLETS, 26 STILT SANDPIPERS and a GULL-BILLED TERN at West End Jones Beach last Sunday, a COMMON RAVEN and a GOLDEN-WINGED WARBLER Monday at Alley Pond Park, 8 CORY'S SHEARWATERS at Robert Moses State Park at Fire Island seawatch last Monday, 2 CASPIAN TERNS at Robert Moses State Park at Fire Island on Wednesday. A WHITE-TAILED KITE was still present today at the Audubon property at Stratford Point in Stratford Connecticut. Please call in reports to Tony Lauro at (631) 734-4126, messages may be left with Tom Burke at (212) 372-1483. 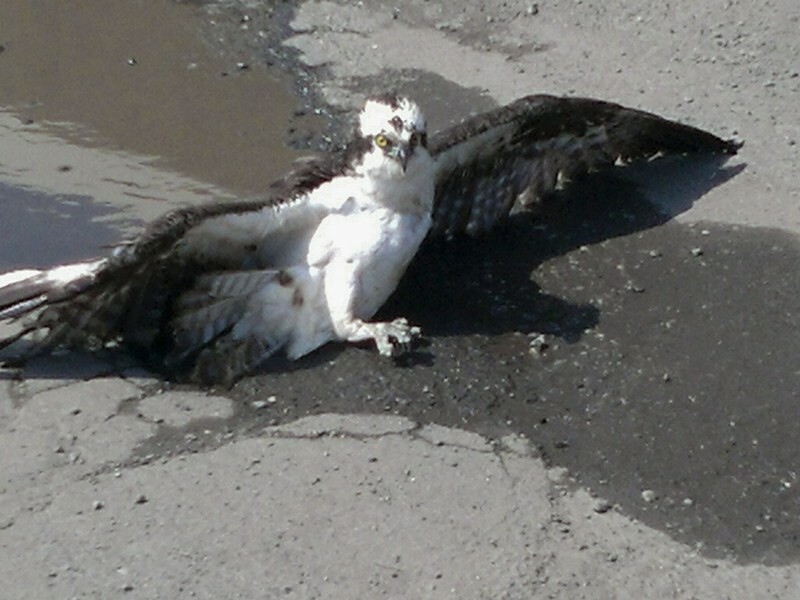 I received an email yesterday about an injured Osprey found in a parking lot near Shea Stadium (I mean, CitiField), in Queens. James O'Brien met Bobby Horvath at the site and has a follow-up on his blog "The Origin of Species". Diamondback Terrapins are found in brackish waters along the eastern and southern coasts of North America. 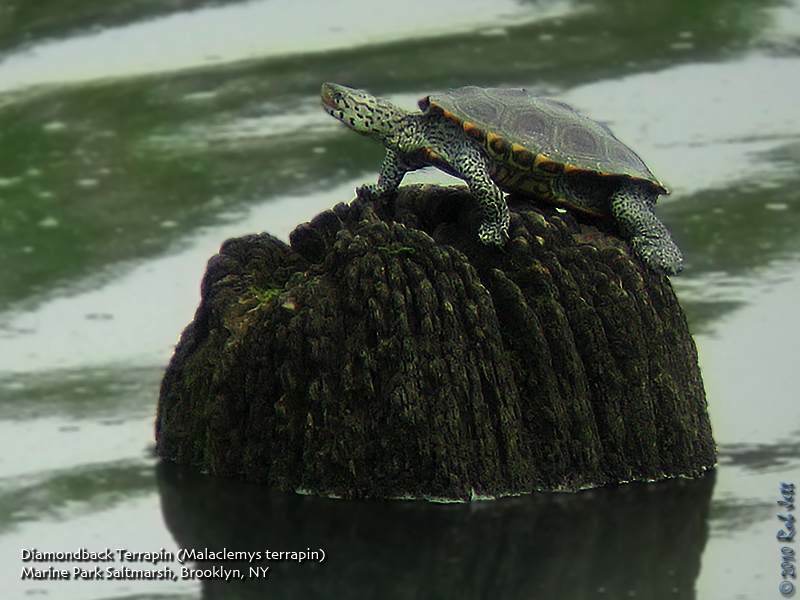 I spotted this individual on a recent visit to the Marine Park Saltmarsh Nature Center in Brooklyn. There were actually quite a few close to the shoreline, which is very unusual. 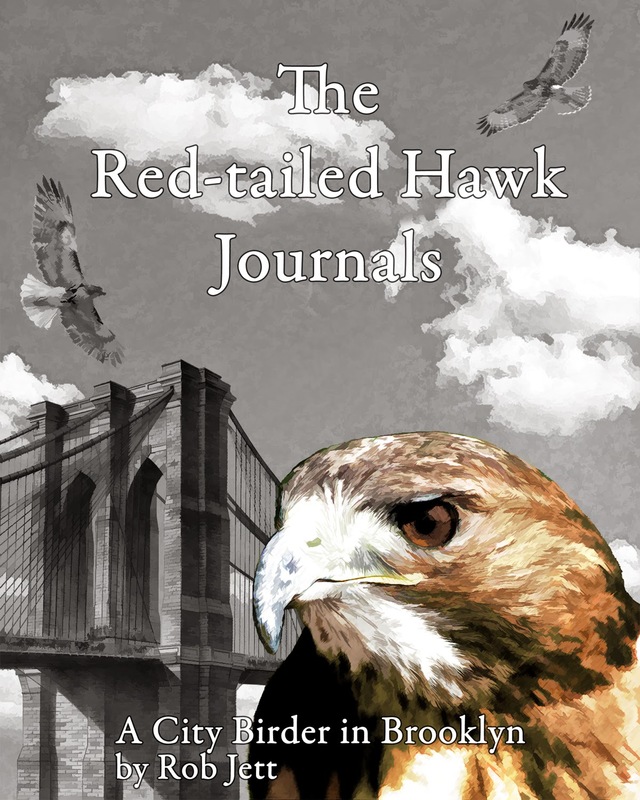 I've been a little negligent this summer with regard to my Red-tailed Hawk family updates. I was reminded of this when I ran into a Brooklyn birder at Jamaica Bay Wildlife Refuge last weekend. She asked how all the hawks were doing (since I hadn't posted on my blog). Parents Nelly and Max successfully fledged three hawks. I visited the area several times after the young hawks left the next. A few weeks into their new found freedom I realized that I couldn't find one of the trio. Eventually I learned from Bobby that a juvenile red-tail was picked up by rangers near the north end of the park. The raptor was ill. Wildlife specialists determined that it was afflicted with a fairly common avian disease called "frounce". I don't know if it survived and has been released back into the park. Last week I did find one of the juveniles flying over Lookout Hill, calling for his parents. Nelly and Max appeared in the sky to the north and she followed them towards Nelly's Lawn, crying the whole time. For the 9th year, adult red-tails Alice and Ralph nested in a pine tree in the Ravine. They had 2 offspring which successfully fledged. I haven't been able to determine where they have gone. Presumably they are alright because the park rangers haven't been called regarding any other ill raptors. Big Mama and Junior raised two offspring in the cemetery. The carcass of one of the young was discovered a couple of weeks after leaving the nest. Bobby subsequently brought a young, rehabbed red-tail to the cemetery for release. The juvenile male was immediately accepted by his foster family, but vanished within a week. There is good news, however. Heydi emailed me to say that a juvenile red-tail suddenly appeared at the Marine Park Saltmarsh Center, about 4 miles south of the cemetery. 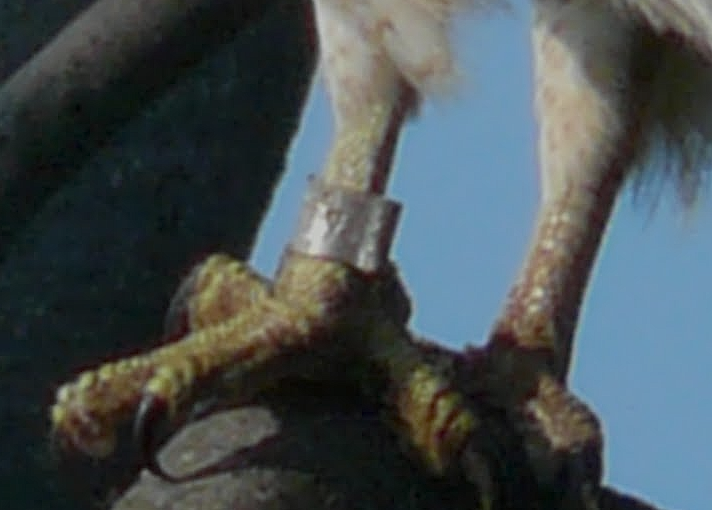 The hawk had a band on its leg and during the two week period that it stayed in that area, she was able to photo the band. I had only photographed half the band numbers prior to release, so I emailed Cathy to find out the full band number. It is "1957-01989". Greetings. This is the New York Rare Bird Alert for Friday, August 20th 2010 at 11:45pm. The highlights of today's tape AMERICAN WHITE PELICAN, BROWN PELICAN, AMERICAN AVOCET, WHIMBREL, MARBLED GODWIT, WILSON'S PHALAROPE, RED-NECKED PHALAROPE, GLAUCOUS GULL and LARK SPARROW. The previously reported AMERICAN WHITE PELICAN was still present today at the East Pond at Jamaica Bay and a BROWN PELICAN was seen last Sunday at Cupsogue County Park. An AMERICAN AVOCET appeared on Wednesday and Thursday at the Oceanside Marine Nature Study Area at the west side of the south pond along with two ROYAL TERNS on Thursday. A WHIMBREL was at the East Pond at Jamaica Bay on Wednesday along with a WILSON'S PHALAROPE and 12 LONG-BILLED DOWITCHERS. Also present today was a RED-NECKED PHALAROPE also at the East Pond. Six MARBLED GODWITS were seen at Cupsogue County Park from Sunday through Tuesday an another MARBLED GODWIT was at the East Pond at Jamaica Bay on Monday. The previously reported GLAUCOUS GULL was still present last Friday and Saturday at the ferry dock at Orient Point and 2 LARK SPARROWS were found on Friday, 1 at Floyd Bennett Field near the tree nursery on Archery Road and the other at Fort Tilden just west of the hawkwatch area. The East Pond at Jamaica Bay continues to be the most productive shorebird area in our region with over 5,000 shorebirds present each day through the week with 15 to 20 species to be found including 40 STILT SANDPIPERS, 2 WHITE-RUMPED SANDPIPERS, 5 WESTERN SANDPIPERS as seen today. Nine species of warblers plus 4 species of vireo (RED-EYED VIREO, WARBLING VIREO, WHITE-EYED VIREO and BLUE-HEADED VIREO) were seen Thursday at Central Park highlighted by a MOURNING WARBLER at the wildflower area. Also seen were a BLUE-GRAY GNATCATCHER, 4 VEERYS and a WOOD THRUSH. COMMON NIGHTHAWKS were reported over the city last week with 15 at Central Park on Tuesday and 4 at Riverside Park on Thursday. A COMMON RAVEN was seen at the tower at the Nassau County Art Museum in Roslyn on Wednesday. A seawatch at Cupsogue County Park on Sunday afternoon produced 87 CORY'S SHEARWATERS, 2 GREATER SHEARWATERS, 1 MANX SHEARWATER, 8 NORTHERN GANNETS and a BLACK TERN. Twenty BOBOLINKS were seen today at the south end of Broad Channel Island and at Breezy Point 4,000 SANDERLINGS, 2,000 SEMIPALMATED PLOVERS and 400 BLACK SKIMMERS were seen today resting on the shoreline. Registration opens Monday 8/16. Public transportation. Saturday, August 28, 8 a.m. to 10 a.m. The fall migration actually picks up steam during the Dog Days of Summer and High Rock Park is as good a place to tally new species of neo-tropical migrants as any other. The storied woodland offers good overlooks so warbler identification does not become neck wrenching work. The tanagers and orioles flit about at eye level and the flycatchers may even call out to be heard. Join Howie Fisher and enjoy some of the Northeast’s finest birding right here on Staten Island. Meet in the Nevada Avenue parking lot. "Formerly regarded as a full species, now considered same species as Red-spotted Purple, they blend where their ranges meet, producing many intermediates. (The species as a whole may be called "Red-spotted Admiral," but it is more useful to identify individuals as White Admiral, Red-spotted Purple, or intergrade.) 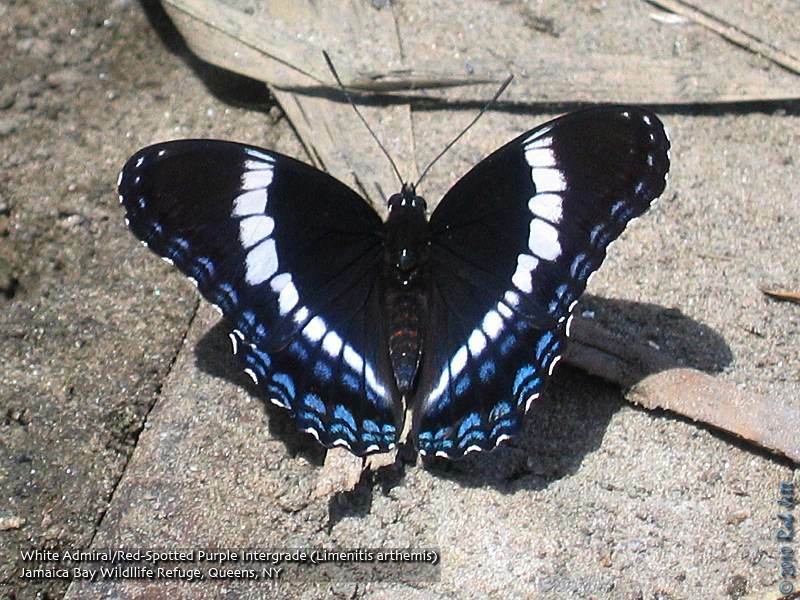 ... Look for highly variable intergrades with Red-spotted Purple in Ontario and northeastern U.S."
Greetings. This is the New York Rare Bird Alert for Friday, August 13th, 2010 at 9:15 pm. The highlights of this week's tape are AMERICAN WHITE PELICAN, HUDSONIAN GODWIT, MARBLED GODWITS, WILSON'S PHALAROPES, and an extralimital report of a WHITE-TAILED KITE. The AMERICAN WHITE PELICAN continued to be seen through today at the East Pond of Jamaica Bay Wildlife Refuge. The HUDSONIAN GODWIT, a MARBLED GODWIT, and three WILSON'S PHALAROPES were present through Thursday at the East Pond of Jamaica Bay. Approximately 5,000 shorebirds of 22 species were seen on the East Pond, along with LONG-BILLED DOWITCHER, WHITE-RUMPED SANDPIPER, WESTERN SANDPIPER, and PECTORAL SANDPIPER. Three MARBLED GODWITS were still present at Cupsogue County Park, West Hampton Dunes, last Sunday. Up to four BLACK TERNS and several GULL-BILLED TERNS were seen through the week at the East Pond of Jamaica Bay. The best passerine migration of the season occurred Wednesday at Central Park. It included 14 species of warbler, plus a BREWSTER'S WARBLER, highlighted by TENNESSEE WARBLER, BLACKBURNIAN WARBLER, WORM-EATING WARBLER, and HOODED WARBLER. Also seen was a GREAT-CRESTED FLYCATCHER, a BLUE-GRAY GNATCATCHER, an INDIGO BUNTING, and 12 BOBOLINKS. Other interesting birds reported for the week were: an immature BALD EAGLE at Cupsogue last Saturday (8/7); a CASPIAN TERN at Jamaica Bay on Tuesday; 39 ROYAL TERNS at Pike's Beach, West Hampton Dunes last Sunday; and 18 NORTHERN WATERTHRUSH at Jamaica Bay on Wednesday. Extralimital: A WHITE-TAILED KITE continued to be found at Stratford, CT through today at Stratford Point and Milford Point, near the Audubon-managed property. Please call in reports to Tony Lauro at (631) 734-4126. Messages may be left with Tom Burke at (212) 372-1483. This service is sponsored by the Linnaean Society of New York and the National Audubon Society. Thank you for calling. Saturday, August 14, 1 p.m. to 3 p.m.
Join naturalist/photographer Sandra Mechanic for an exciting day searching for Spicebush and Eastern Tiger Swallowtails, Pearl Crescent and Monarch Butterflies and the many wildflowers they feed upon. Bring binoculars, field guides and camera if you wish. Meet at the Mt. Loretto Unique Area parking lot south of Sharrott Avenue off Hylan Blvd. We hope to see many children for this exciting pleasant rural scenic stroll. We will walk along the beach to the stone art statues created by Doug Schwartz. Saturday, August 21, 10 a.m. to 2 p.m.
Meet at the entry road to the Eger Nursing Home close to the intersection of Manor Road and Rockland Avenue and walk to the entrance of the White Trail off London Road at its intersection with Meisner. We will attempt to finish removing the English Ivy groundcover between the trail and Meisner that we began 4 years ago. If you don't have your own, Protectors will supply gloves and pruners (& refreshments). After a two hour work session (our 170th consecutive monthly workshop), we will take a short walk over nearby trails. Sunday, August 22, 1 p.m. to 3:30 p.m. Call Sandra Mechanic at (718) 967-1037. Capture the moments that fly by. It ain’t easy. Bring a camera. Find out which plants came from other lands and now call Fort Greene Park home. Berries, Birds and Black Locusts! 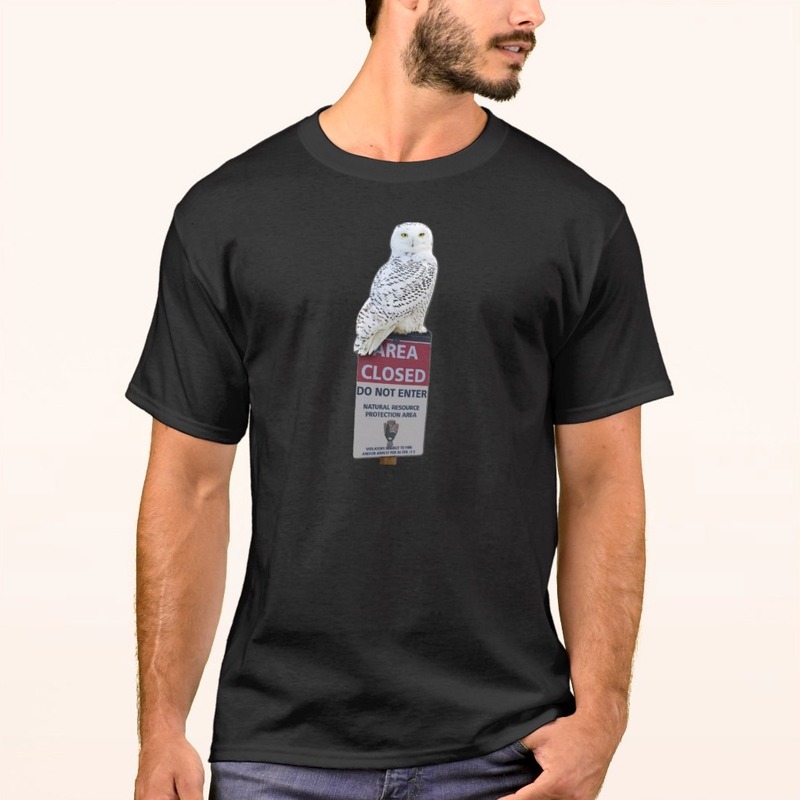 I've just added a new link to the top of the sidebar for my CafePress Store. In and effort to further simplify the look of the sidebar, I'll be adding more of these static pages for items, such as, my Imagekind Photo Store and the Birding Hotspots Maps. The original items would then be removed. Note that you can always return to the main page by clicking "Home". 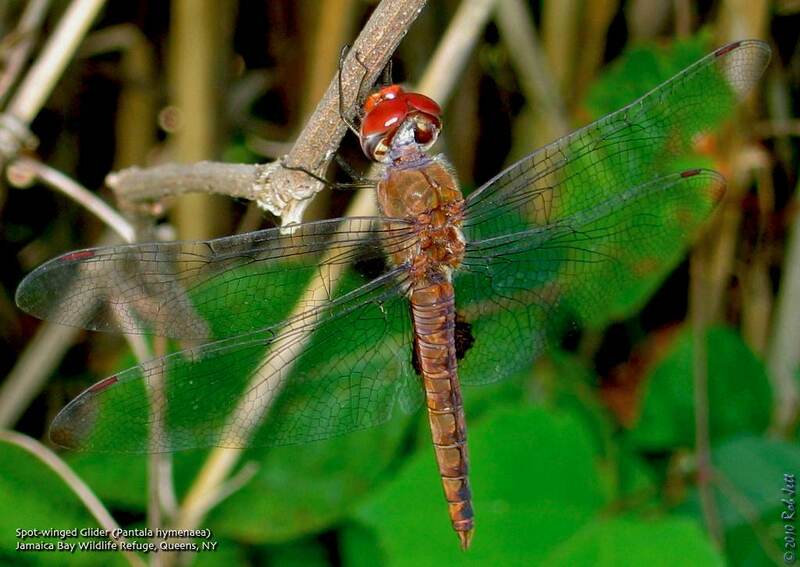 I found this Spot-winged Glider while birding at Jamaica Bay Wildlife Refuge. I'm learning that the common names of some dragonflies sound like they are right out of "Dungeons and Dragons", i.e. Dragonhunter, Tawny Sanddragon, Ebony Boghaunter, sundragon, Smoky Shadowdragon and Red-faced Dragonlet. I made a surprising discovery in Prospect Park yesterday while out for a bike ride. I was mainly in the park to get some exercise, but had my bins and camera with me - just in case. The park's breeding birds, for the most park, have completed raising their yearly broods. Some of the more obvious juvenile bird species I noted while pedaling the park's loop roadway were Eastern Kingbird, House Wren, American Robin, Gray Catbird, European Starling, Northern Cardinal, Baltimore Oriole, Common Grackle, American Goldfinch and House Sparrow. One of the juvenile Red-tailed Hawks was crying for her parents as she soared over Lookout Hill. As I passed the Boathouse I heard some robins making alert calls, so decided to stop and investigate. Walking towards the source of the sounds next to the East Wood Building, I assumed that the object of the robin's irritation would be one of the park's Red-tailed Hawks. Instead, what I found was a Green Heron perched on a dead branch above the walkway. 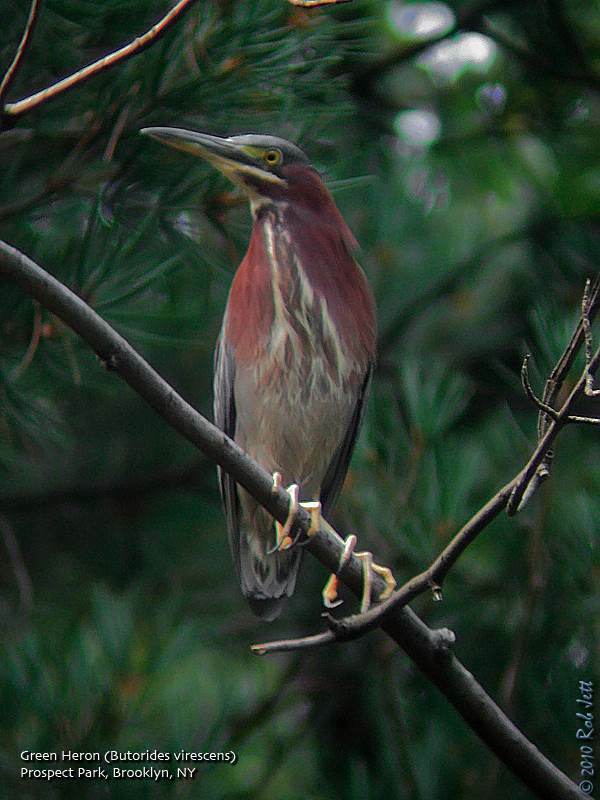 It was an unlikely Green Heron roost as it was in a fairly dense stand of trees, fifty yards away from the water. I'd never considered that the tiny Green Heron could be a threat to any animals other than small fish, frogs and dragonflies, but a pair of robins seemed extremely unhappy with this bird's presence. As I was watching, two Urban Park Rangers walked out of the building and asked what I was seeing. When I pointed out the heron they remarked that it had been in that spot for 3 or 4 days. It seemed fairly late in the season for Green Herons to be breeding, but its behavior suggested that there was a nest nearby. When the heron flew from its perch to an adjacent Box Elder I scanned the tree for a possible nest. I found it directly above a white spattered section of path. I assumed that it was a nest from earlier in the summer and that any young had already fledged. As the rangers walked away, I focused my bins on the nest and noticed something moving. A single young heron was still in the nest! I waved the rangers back to share my discovery. 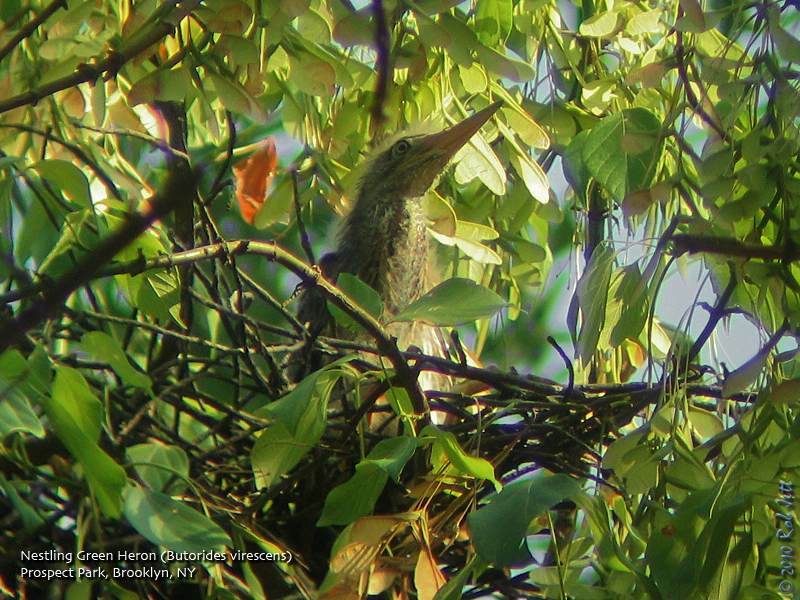 Green Herons develop very rapidly and begin climbing around outside their nest while still very young. If you'd like to get a glimpse of this cute baby bird (in a homely kind of way), I suggest getting into Prospect Park this weekend. The nest is right above the path to the East Wood Building - that's the small building about 75 yards north of the Audubon Nature Center (The Boathouse). 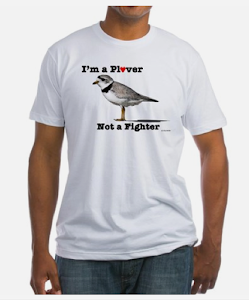 In recognition of the plight of migrating shorebirds, I've created a new T-Shirt. 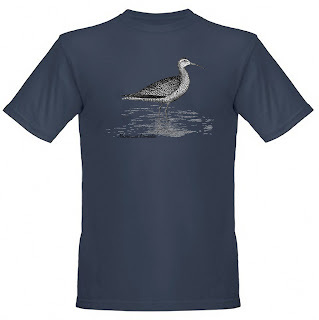 The simple design is of an Eskimo Curlew based on the early 20th century woodcut by Edward Howe Forbush. Many of the western hemisphere's species of shorebirds are under increasing pressure from human activities, most notably, the Red Knot. The Eskimo Curlew was once the most abundant species in North America, but is now considered by many experts to be extinct. This is a cautionary tale and urgent reminder that we cannot delay actions to save remaining species. 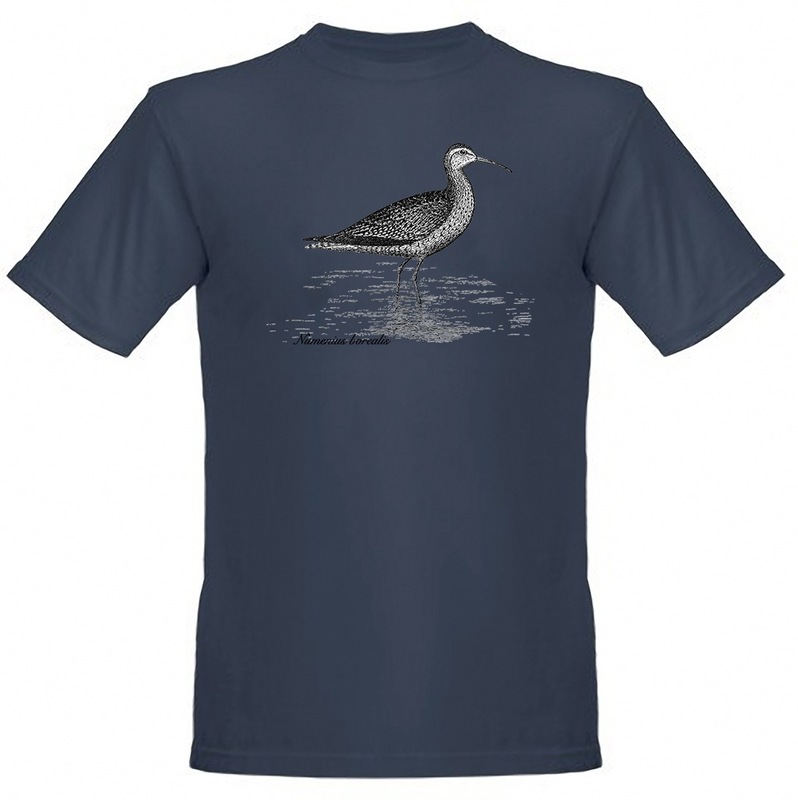 The Eskimo Curlew T-Shirt is available in yellow here, 9 colors here and an organic cotton shirt in olive or pacific (pictured below) here. 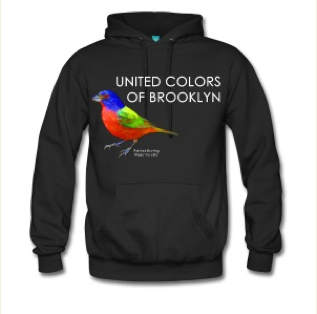 The City Birder Shop main page is here. An all-day event during peak fall shorebird migration in Jamaica Bay. The day will start with guided walks around the ponds and after lunch experts will give presentations on shorebird identification and nature photography. Limited to 75, suggested donation $20. This hands-on workshop emphasizes a more complete approach to shorebird identification using both non-changeable physical impressions and details of plumage and feather patterns. Kevin Karlson and Lloyd Spitalnik will explain how to build a solid foundation for shorebird ID using basic impressions of size, shape and body language, and then combine detailed study of plumage and feather patterns to fine tune your ID conclusion. This workshop is suitable for birders of all levels, but sometimes includes advanced tips. Kevin’s book “The Shorebird Guide” will be available for sale and a personal inscription. The small class size allows for personal instruction and one-on-one interaction with both instructors that is not possible with larger workshops. Limited to 15. Saturday, August 14, 11 a.m. to 1 p.m.
We’ll stroll along Old Mill Road, a newly designed multi-use trail, next to Freshkills, below the hills of Latourette Golf Course, and return along the Blue Trail. This area has not been accessible for many years and is now open. We are surrounded by beautiful, old woodlands as well as newly grown stands of cottonwoods and other pioneer plants. We’ll see the flow of the famous Hessian Spring as it crosses the road and view Freshkills estuary. Park behind St. Andrew’s Church at the base of Snake Hill. Hike to the top of Look Out Hill for a trip to a bird watchers’ wonderland. Mid-August is generally considered the peak of the southbound shorebird migration in New York. In celebration, next Saturday will be the 5th Annual Jamaica Bay Shorebird Festival. Jamaica Bay Wildlife Refuge is a hotspot for shorebirds during both the Spring and Fall migration. Finding rare species here has become a seemingly regular occurrence. A presentation on shorebird identification by author Kevin Karlson will cap off a great day of birding. The event is sponsored by American Littoral Society and Gateway National Recreation Area and New York City Audubon Society. For more information or to register, contact Don Riepe at 718-318-9344 or driepe [AT] nyc.rr.com. 9:00am - Don Riepe slide show presentation on history of the bay and problems we're facing. 9:30am - Lloyd Spitalnik slide show on "The Shorebirds of Jamaica Bay"
10am to 12:00pm - Guided walks to both the East and West Pond. 12:45pm - Guided walk on the north end of the East Pond (bring rubber boots or the like. Greetings. This is the New York Rare Bird Alert for Saturday, August 7, 2010 at 12:00 pm. The highlights of this week's tape are BLACK-BELLIED WHISTLING-DUCK, AMERICAN WHITE PELICAN, BROWN PELICAN, MISSISSIPPI KITE, AMERICAN AVOCET, WHIMBREL, HUDSONIAN GODWIT, MARBLED GODWITS, WILSON'S PHALAROPES, RED-NECKED PHALAROPE, shorebird migration, and GLAUCOUS GULL. A BLACK-BELLIED WHISTLING-DUCK was found last Saturday and lingered through Tuesday at the West Pond of Jamaica Bay Wildlife Refuge near Bench 7. The AMERICAN WHITE PELICAN was still present through yesterday at the East Pond Jamaica Bay, and a BROWN PELICAN was found at the Rockaway Inlet on Tuesday. A MISSISSIPPI KITE was seen flying over the North Marsh at Jamaica Bay on Monday. An AMERICAN AVOCET, a HUDSONIAN GODWIT, and three MARBLED GODWITS were seen yesterday at the East Pond Jamaica Bay. Another three MARBLED GODWITS were seen Thursday and Friday at Cupsogue County Park in West Hampton Dunes. A WHIMBREL was seen flying over the mussel flats at the Ponquogue Bridge at Shinnecock on Wednesday. Three WILSON'S PHALAROPES were found yesterday at the East Pond of Jamaica Bay, and a RED-NECKED PHALAROPE along with one SOOTY SHEARWATER, two GREAT SHEARWATERS, one CORY'S SHEARWATER, 20-30 WILSON'S STORM-PETRELS, and two BLACK TERNS were noted on a whale watching trip out of Montauk last Sunday. Shorebird migration continued at a good pace through the week, with about 20 species totaling about 6000 birds at the East Pond of Jamaica Bay, including those mentioned previously along with "Western" WILLET, WESTERN SANDPIPER, WHITE-RUMPED SANDPIPER, PECTORAL SANDPIPER, STILT SANDPIPER, LONG-BILLED DOWITCHER, AMERICAN WOODCOCK, 4000 SHORT-BILLED DOWITCHERS and 1000 SEMIPALMATED SANDPIPERS. The shorebirds at Cupsogue County Park and Pike's Beach at West Hampton Dunes, totaled about 1500 birds of about 15 species, including WESTERN SANDPIPER and LONG-BILLED DOWITCHER. An immature GLAUCOUS GULL was found last Wednesday at the ferry slip at Orient Point. Other interesting bird sightings last week included ten species of waders at Jamaica Bay through the week. These include LEAST BITTERN, GREAT BLUE HERON, GREAT EGRET, SNOWY EGRET, LITTLE BLUE HERON, TRICOLORED HERON, GREEN HERON, BLACK-CROWNED NIGHT-HERON, YELLOW-CROWNED NIGHT-HERON, and GLOSSY IBIS. Small numbers of CORY'S SHEARWATERS and WILSON'S STORM-PETRELS have been seen through the week at South Shore vantage points. 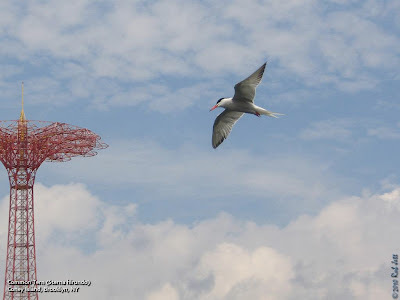 36 ROYAL TERNS at Pike's Beach were reported on Tuesday and 42 on Wednesday, along with small numbers of BLACK TERNS at Jamaica Bay and Cupsogue County Park. Last Sunday six species of warblers were seen in Central Park, including BLUE-WINGED WARBLER, TENNESSEE WARBLER, YELLOW WARBLER, BLACK-AND-WHITE WARBLER, AMERICAN REDSTART, and NORTHERN WATERTHRUSH. Please call in reports to Tony Lauro at (631) 734-4126. Messages may be left with Tom Burke at (212) 372-1483. Thank you for calling. A small number of Common Terns have discovered the fishermen at the Coney Island Pier (aka Steeplechase Pier). They seem to excel at stealing the bait from the hook after the line is cast. July is the month when southbound shorebirds and seabirds begin passing through New York, so it is no surprise that the majority of the species I added to my year list last month fall into those families. As I described in this shore-birding post, a trip out to eastern Long Island's south shore paid off big with 11 new species for the year. With no new birds showing up in Brooklyn, the next best thing to do was to take a couple of trips out to Jamaica Bay Wildlife Refuge (most of the refuge falls within the borough of Queens). In addition to the rare white pelicans that dropped in at the refuge, adding a Least Bittern sighting was a nice surprise. Apparently, these tiny wading birds nest within the refuge, but are rarely seen. Thanks to a heads up from my friend Shane, myself and many others were able to spot this secretive bird along the edge of the East Pond. I ended the month with 242 species on my year list.